Things I liked: Great target for airsoft pistols. Three targets to choose from that reset themselves every time you shoot the target to the left. The targets are made from flexible materials that can stand up to repeated abuse and it comes with three extra targets encase the do break. The netting in the back works well in catching the bbs. 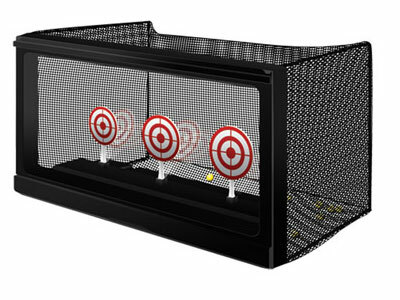 Things I would have changed: The targets need to be a little more recessed into the netting. The bbs do have a tendency to fly out when the targets are struck and the netting doesn't catch them all the time. The targets do not fall all the way flat when they are struck. From a distance it looks like their still standing. What others should know: The description on the website says that this target requires batteries. It does not require batteries.